The 40 Days for Life prayer vigil is an important opportunity for people to stand as a witness against “this scourge in our society,” said Bishop Dewane. He certainly gets it, doesn't he? 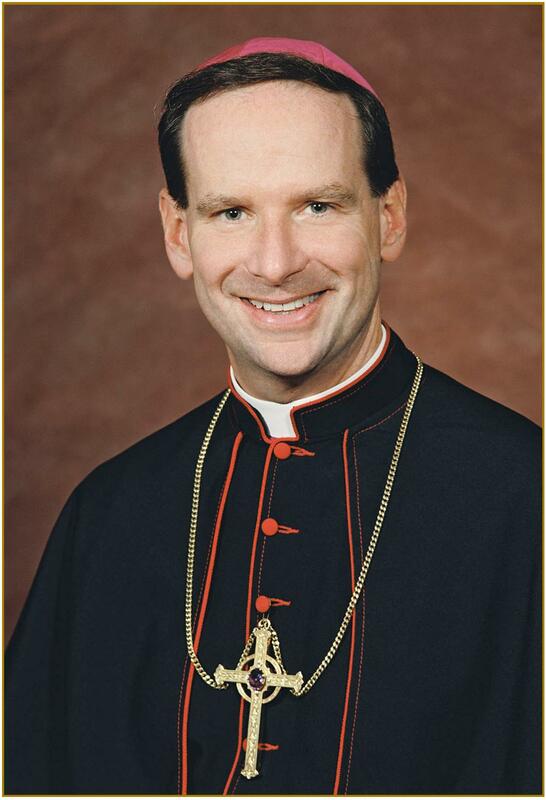 Bishop Frank Dewane, for the Diocese of Venice in southwest Florida, I give you the Domestic Apologist High Five. 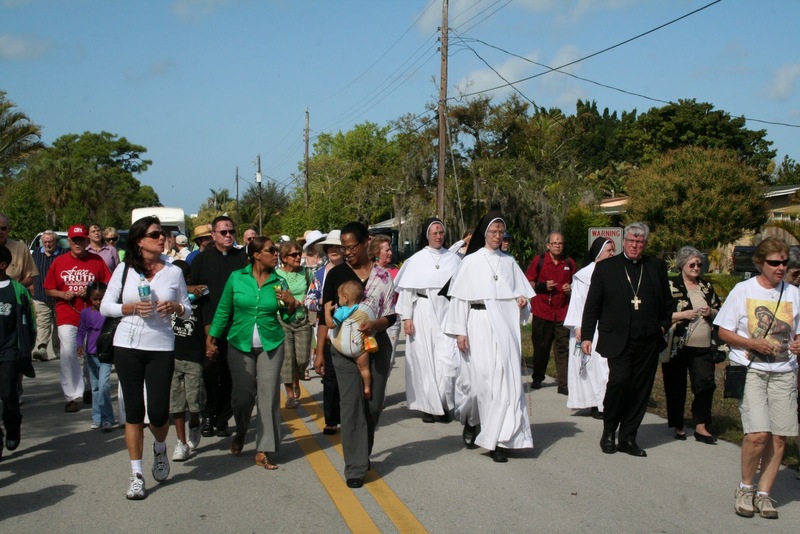 Bishop Frank J. Dewane joined a group from Epiphany Cathedral Parish on Oct. 12, the mid-point of the 40 days vigil. He thanked them for coming out expressed how important it is to have a show of numbers each day throughout the 40 days. 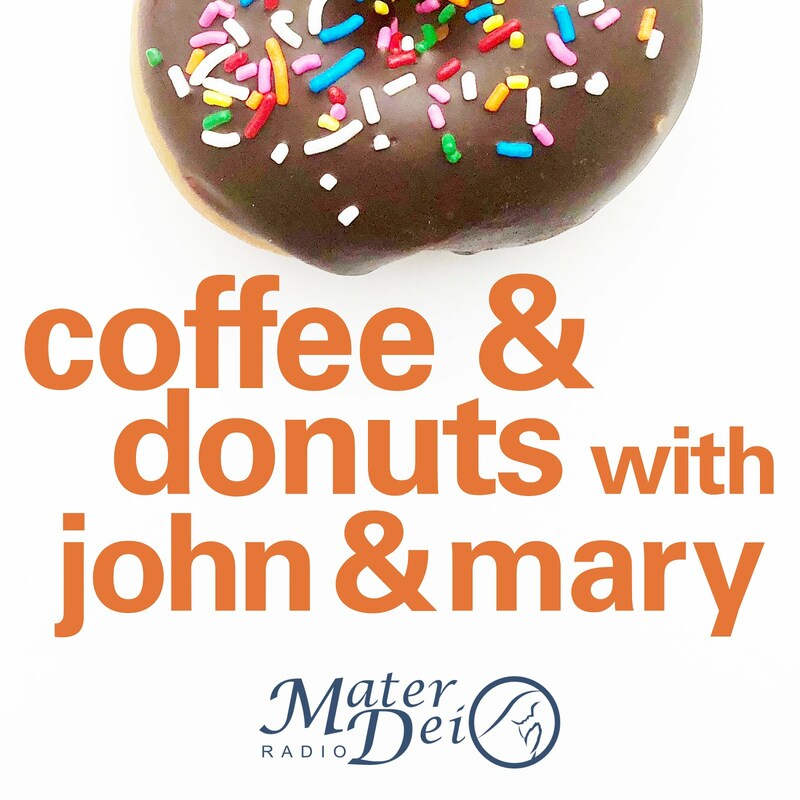 “It is our responsibility as Catholic [sic] to do this. We stand to defend life from conception to natural death. By coming out here, you make a difference,” Bishop Dewane added. Calling prayerful vigil outside of abortion clinics a "responsibility" for Catholics. How refreshing. So long, Thing 1 and Thing 2. When parents are watching their own programs, this is “background media” for their children. Itdistracts the parent and decreases parent-child interaction. Its presence may also interfere with a young child’s learning from play and activities. Instead of screens, opt for supervised independent play for infants and young children during times that a parent cannot sit down and actively engage in play with the child. For example, have the child play with nesting cups on the floor nearby while a parent prepares dinner. All of those thoughts came flooding back as I looked at that old picture yesterday afternoon. Then a crashing sound caught my attention, and I turned around in time to see two of my kids dump out a box of books and begin throwing them at one another. My oldest child shouted from upstairs that he wanted to know if, theoretically, puddles of black ink are hard to get out of carpets. Then the baby started crying. I gathered the middle kids, put on an hour-long episode of Dora the Explorer, and implored them to LOOK AT THE NICE GLOWING SCREEN, ignoring their protests that they’d already seen it twice today. Then I tossed some formula into a bottle and popped it in the baby’s mouth, since even five lactation consultants had not been enough to help me to figure out breastfeeding. Everything in that AAP statement sounds right. I know that having the news or What Not to Wear on distracts me from each and every playtime moment of Baby J if he's up and toddling around. But I also know that he points out animals, dances to songs and points to characters he likes in those PBS Kids shows. But, I'll plop Joey down next to me with some nesting cups tomorrow when I prepare dinner. We'll see how long his "unstructured play time" can last before I implore him to just go look at the NICE GLOWING SCREEN. Who do you go for? Think past the fetus and consider the systemic issues of children living in poverty, think of the women who died unnecessary, bloody and painful deaths. Pro-choice is not an immoral stance, it is a stance, which holistically considers multiple layers of moral decisions and the impact they have on others. People will find a way to have abortions whether or not you ban them, but that does not mean they will be safe. "Pro-choice...holistically considers multiple layers of moral decisions." Wow. There's a stretch. But that thought came to mind as Baby J and I arrived at Planned Parenthood yesterday during our 40 Days for Life time slot. A woman drove up and parked behind me as I was unloading the stroller from my trunk. She later introduced herself as Robin from a local parish, and we had a pleasant little pro-life tête-à-tête, as most of the prayer volunteers do. Baby J and I then commenced our little ritual: I pray a rosary while pushing the stroller and, if good baby behavior and good weather permit, a Divine Mercy chaplet; he eats Cheerios and plays with an old cell phone, giving the occasional wave to a passing motorcycle. At the end of our time slot, I saw that another woman had joined Robin, who was praying a rosary. The second woman didn't have a rosary, and as I was passing, I asked if she'd like to pray with my spare. She took me up on the offer. Robin then introduced her as Sandy, also sharing that she worked at the local crisis pregnancy center. Wonderful, I said! But then Robin gave me a bit of a wink, and said, "Hey, show her those signs I saw in your trunk, Mary." Hmm. Robin had sharp eyes. Inside my trunk, I keep two signs from the Silent No More awareness campaign--a subgroup of Priests for Life who encourage post-abortive men and women to share their pain and bring to light the bitter truth that yes, abortion really does harm women. While I had no qualms giving away one of my two signs, I didn't want to force a sign reading "Women Do Regret Abortion" on an unsuspecting gal. I said as much to them. But then Sandy, in a voice low but firm, said, "Well, I am post-abortive, so I'd love to hold it." Bam. Bam bam bam. Few times in my life have I gotten to talk with, pray with and hug a woman with an abortion in her past, but every time I do, I feel the grace of God's divine, healing, fulfilling, heart-filling love. I am inspired by their courage. I am awed by their humility. I am chastened that my own heart can be so quick to judge. And I am renewed in my resolve to be at that abortion clinic. You never know who are out there for: pregnant mothers, scared teenagers, or post-abortive women suffering silently. You never know who God is about to put in your path. We must think past the rhetoric that an abortion is ever a good solution for a woman and her baby. We must think past the idea that poverty, poor medical conditions or other "hard cases" of moral severity justify the taking of innocent life. Do pro-lifers stand in peaceful protest outside of abortion clinics because they care about unborn children and not pregnant mothers? Ask Sandy. 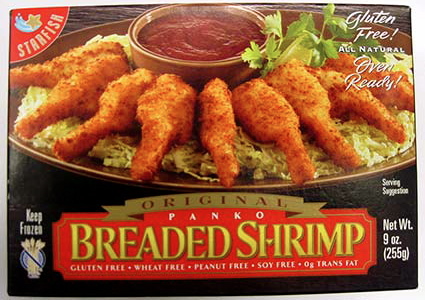 G-free review: Breaded shrimp. Yum. Baby J and I ventured out to our local grocery store last night to pick up some dinner. My intent had been to buy a box of Starfish's delectable Gluten-Free Frozen Battered Cod, then scoop up some cilantro, cabbage, corn tortillas, pepper jack cheese and limes, making a fish taco feast. But what did I find next to the cod? A treat I haven't had in about five years, since going gluten free. Shrimp, my friends. Crispy, breaded, fattening, serve-me-with-crinkle-cut-fries-and-cocktail-sauce shrimp. It's possible I drooled on the freezer door. There's no four-tiered rating today for gluten-free battered shrimp, though. And why? I've never seen a like product, at least not on the West Coast. G-Free Gold Star: Besides being a bit smaller than the jumbo breaded shrimp I ate growing up, these little delights fit the bill just fine. Starfish sells crispy, battered, gluten-free versions of both cod, haddock and halibut, and even makes an Italian-breaded sole fillet. All are equally tasty to me, and all crisp up beautifully in a hot oven. Regular price at my grocery store, the battered fish sells for about $6 a box--not cheap, but all seafood in the Inland Northwest is already pricey, anyway. My store priced the breaded shrimp at about $7.50 a box, but had them on sale for $5.99. I splurged and picked up two: one box of the regular panko style, and one "salt and cracked black pepper" flavor. Both kinds reduced our dinner-table conversation to a steady stream of "oh man, that's good" and "ah, yum ... pass that cocktail sauce." Baby J took a bite of the breading and seemed to like it, but stuck mostly to the fries. One-third of Starfish's product line now consists of gluten-free items, and I sure hope they're selling them like hotcakes--or crab cakes, which I hope they'll start making. 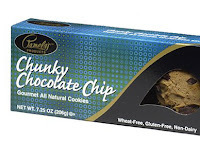 G-Free review: chocolate chip cookies! If it's good, it's not cheap; and if it's cheap, it's not good. My beloved Nebraskan-Polish grandfather lived by that line (along with "Rest when you're dead, dammit"). For the vast majority of things in life, his line rang true--cheap cars break down; cheap hair dryers last until you've got an 8 a.m. meeting and could really use a good hair day. But for off-the-shelf gluten-free items, a gross, crumbly, textureless chocolate chip cookie can cost just as much (or more) as a delicious one. Here are my winning--and losing--picks for that immortal sweet snack. G-Free Gold Star: Hands down, the best chocolate chip cookie on the g-free market comes from Udi's. Chock-full of chocolate chips (no carob here), Udi's cookie dough has a barely-baked quality to it, making for a chewy, hearty bite each time. At my local grocery stores, though, they retail for about $5.99 for a container of 10 cookies. Paying nearly $6 for 8 oz. of cookie joy is asking a lot from my wallet. But when they go on sale...yuuuum. Cheap G-Free Gold Star: Arguably as expensive, but packaged in a smaller quantity and a corresponding lower price, I give the WOW Baking Company single-serve chocolate chip cookie the cheap gold star. WOW (for With Out Wheat) works under the same philosophy as Udi's--that creating baked goods sans gluten doesn't mean they should leave out the eggs, sugar and butter as well. Fred Meyer sells these goodies for $1.89 per cookie, making it a quick, cheap treat. G-Free Passably: Nearly every store with a gluten-free section carries something from Pamela's Products, and rightly so. From baking mixes to cheesecakes, and biscotti to granola bars, they run the g-free gamut. As for their cookies, the only one I find tolerable is from their "Simplebites" cookie. Think of them as the g-free Chips Ahoy counterpart--crunchy and, well, just standard. At around $3.69 for a 7 oz. package, they work in a pinch. G-Free Miserably: Poor Pamela takes my bottom slot with her line's other chocolate chip cookie. Dense and crumbly with an almost powdery aftertaste, I'm not a fan. 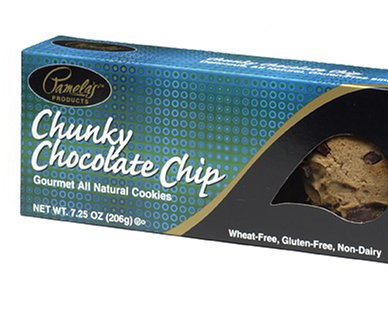 What are your g-free cookie favorites? Tell me what I missed! The short story? I live a practically gluten-free life. Practically all gluten is gone from my diet (but the teeny amount in soy sauce treats me just fine). But, I cook practically too--you won't find eight jars of varying gluten-free flour in my kitchen which I measure out by the gram to create my custom all-purpose flour mix when I bake my homemade graham crackers. Many kudos to those who can. That just ain't me. These do just fine. The long story involves many years of upset stomach, misplaced lactose-free fanaticism, the purchase of a few IBS cookbooks and many lonely months without coffee. In the end, it all led to the real culprit, gluten. Someday, if I have time and energy after doing the dishes, I'll write about it. G-Free Gold Star: It's delicious and is the best product I've tasted in the category. Cheap G-Free Gold Star: It's delicious, it's the best product I've tasted in the category, AND it's reasonably priced--meaning I'll buy it more than once a week, instead of once in a while as a treat. G-Free Passably: Yeah, it'll work in a pinch. G-Free Miserably: Don't waste your husband's hard-earned money. Ha! Gluten-free reviews forthcoming. 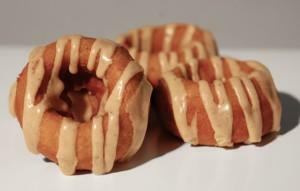 Hope your tastebuds are already craving pumpkin-spice donuts... I know mine are. Life, chains, and Life Chain Sunday. Life: My sister just gave birth to our family's newest little darling--a boy, a sweet, precious, mellow little boy. 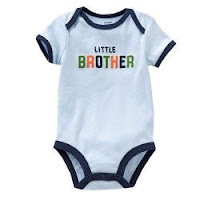 Upon seeing him for the first time on the day of his birth, I couldn't help but cry. One day, I'll get to say to him, "I've known you since the day you were born." Granted, that means I'm getting older. But what a wonderful time of life it is. Praise God. Chains: Sean is still enchained with his persistent pain. We're to the phase with his treatment that we expect to see, any day now, some improvement. We'll continue looking for that first little glimmer of relief over the next few months. In the meantime, he limps and struggles when he's at home, and puts on one hell of a brave face when anyone else is looking. A dear old family friend (one who has known me since, yes, about the day I was born) sent us a watercolored card with this message on the front: Don't quit before the miracle. Life Chain Sunday: I wish I would have brought a camera with me to Life Chain Sunday today. Unlike last year's rather weak attendance, this year, at least 60 pro-life signs dotted Ruby Avenue. 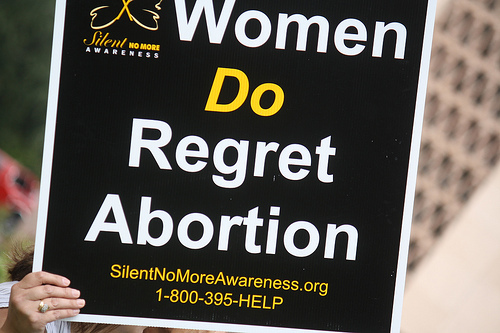 Standing on the corner, holding a "Women Do Regret Abortion" sign, I couldn't help but smile: We were men and women, young (15 months) and old (maybe 75 years), Catholics and other Christian faiths. We all stood in the beautiful October sunshine, publicly defending life, waving to those driving by with happy honks, and smiling at those with flipping middle fingers (to which I always think, "Stop flipping me off and steer"). The decision is wrong on many levels. Preventive services are aimed at preventing diseases (e.g., by vaccinations) or detecting them early to aid prompt treatment (e.g., screening for diabetes or cancer). But pregnancy is not a disease. It is the normal, healthy state by which each of us came into the world. Far from preventing disease, contraceptives can have serious health consequences of their own, for example, increasing the risk of acquiring a sexually transmitted disease, such as AIDS, increasing the risk of breast cancer from excess estrogen, and of blood clots that can lead to stroke from synthetic progestin. Mandating such coverage shows neither respect for women’s health or freedom, nor respect for the consciences of those who do not want to take part in such problematic initiatives. That's just it: Secular society today would happily see both morality and religion vanish (or be persecuted out of existence). And so life, chains, and Life Chain Sunday all have their part to play in building a culture of life. Bringing new life into the world means that we try and raise those people who are happily bridled by both morality and religion--I know I am. 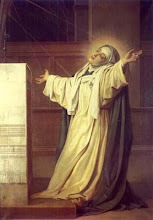 The chains of suffering in life keep us close to the Cross, waiting for our miracle. And Life Chain Sunday? It shows, among other things, that morality and religion are far from vanishing. In fact, they're right there, on the corner of Ruby and Mission in Spokane, Wash.
On September 30, about 30 pro-life advocates gathered for the Fall Vigil of the national pro-life campaign, 40 Days for Life, outside “A Woman’s Choice” clinic in Raleigh. The Most Reverend Michael F. Burbidge, Bishop of Raleigh, and Mrs. Jacqueline Bonk, Director of the Diocesan Office of Pro-Life, gathered with the faithful to pray the Rosary. Among those participating was a group of students from Cardinal Gibbons Catholic High School in Raleigh.